The perfect, convenient kit for vacationers and seasoned anglers traveling to Northern Wisconsin. Designed and conceived by Rob Manthei, Professional Guide and frequent celebrity on the John Gillespie Waters & Woods weekly TV Show; Rob has taken all the guess work out of the jig selection and rigging best used on Northern Wisconsin waters. 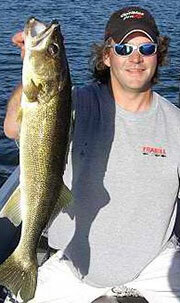 The Northern Wisconsin Jig'n Kit is designed specifically for Walleyes, Pike, Smallmouth and Largemouth Bass. Complete rigging diagrams clearly illustrate which jig to use and when and how to bait the individual jigs with either live bait or plastics. The Kit is ideal for Spring, Summer and Fall fishing and contains (4) different jig designs for fishing in weeds, wood and rock structure. The 25-piece kit comes in a compact Plano box with complete instructions.